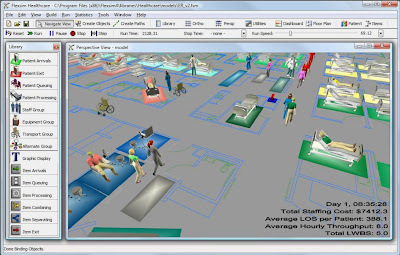 Following my prior posting Serious Games For Visualizing Any Business Process, which covers PC-based simulation software application used to model, simulate, and visualize any business process you manage, Flexsim has made available another commercial software application specifically designed for patient flow simulation. Flexsim software has found wide application in manufacturing, logistics, and supply chain analysis, as well as in traditional business applications related to marketing, management, finance, and academic areas. It is from this vast experience that Flexsim Healthcare TM was born. Medical facilities are among the most complex in the world. Numerous factors contribute to overall efficiency and workflow, including: patient flow, staff utilization and resource management. Flexsim has teamed up with healthcare professionals to create a tool for modeling the complexities and nuances of healthcare management without the need for programming. You build and interact with your simulation in an easy-to-use 3D environment. Viewing your simulation in 3D gives a true understanding of your system, its interactions, and how to improve it. It's well known in the field of simulation that patient service models are among the most complicated and difficult to construct. This is partly due to the amount and complexity of the data needed to define the models, partly due to the diverse services provided to patients in a healthcare setting, and partly due to the complex way in which resources are allocated when providing these services. There is a huge motivation to optimize the utilization of hospital resources so as to cut costs and improve patient satisfaction. Flexsim has developed a patient simulator called Flexsim Healthcare TM to specifically address the historically difficult task of simulating patient services. This new software tool has been designed specifically for non-technical healthcare personnel. In a friendly and very visual 3D environment, anyone with a general knowledge of patient flow can quickly and easily construct a realistic computer model, and immediately begin learning practical ways to improve performance as they test a number of possible scenarios. Most healthcare delivery systems can be characterized as complex and random. The more complex and random a process is, the greater the need is to employ computer-based tools to study and improve the system. While spreadsheets perform many complex calculations, their use of average numbers to represent patient arrivals, examination and waiting times, and resource availability do not allow them to account for the randomness and interdependence that always characterize healthcare delivery systems. Simulation, however, does allow end-users to include randomness and interdependence. As a result, patient delivery systems, such as an emergency room, surgical center, or imaging department will always benefit from simulation, where “benefit” is generally defined as serving more patients per unit of time while maintaining or even reducing costs. Healthcare organizations that have been well managed over time are always looking for methods, people, and tools to improve what they do and how they do it. To this end, simulation may be the single most pragmatic tool to improving patient flows. In fact, because of its low cost and immediate benefits, simulation has the potential to generate a huge return on its investment.